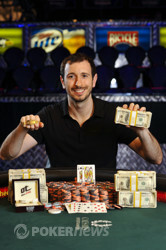 Congratulations to Brian Rast, Winner of the 2011 $50,000 Poker Player's Championship ($1,720,328)! Brian Rast is the bracelet winner in event 55, The Players' Championship. And that folks, is a wrap! After nearly 12 hours of final table play, the tournament is finally over. The last man standing at the end of the night is Brian Rast, winner of the 2011 $50,000 Poker Player's Championship and $1,720,328. Rast also wins his second gold bracelet of this World Series of Poker and the David "Chip" Reese memorial trophy. At the beginning of the day, Rast sat second in chips to Minh Ly with nine players remaining. It wasn't until one more player hit the rail that the final table would be set. That player to fall in ninth place was Jason Lester. He fell at the hands of the chip leader Ly. The two got all of the money in on an ace-high flop with Ly holding a dominated to Lester's . The turn produced an eight and that was what sent Lester out the door. The next player to exit was WSOP Player of the Year leader (at the time) Ben Lamb. Short stacked, Lamb was all in preflop with the against Scott Seiver's . The board ran out and Lamb was gone in eighth. Although Seiver sent Lamb packing in eighth, he wouldn't go much further himself as he went on to fall in seventh place. On the 34th hand of the official final table, Seiver ran pocket eights into Rast's pocket aces preflop. Seiver was unable to find the help he needed to stay alive in the tournament and was sent home with nearly a quarter of a million dollars for his effort. Finishing in sixth place was George Lind. Lind fell at the hands of Ly, who turned a flush against Lind's turned two pair before the money went in. Unable to find a full house on the river, Lind exited in sixth place for just over $300,000 in prize money. Matt Glantz was the fifth-place finisher and he too was eliminated by Ly. Glantz moved all in on the flop with the for a combo draw. He was called by Ly and the for top pair, top kicker. The turn was the and the river was the to keep Ly in the lead and win him the hand. 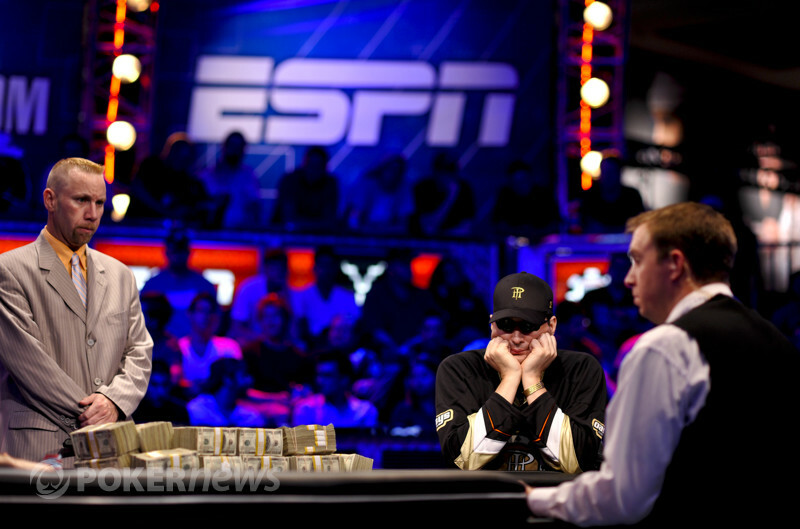 With four players left, Phil Hellmuth held the chip lead and began extending it right away. He kept constant pressure on his shorter-stacked opponents in order to keep climbing and climbing. Rast was able to battle back though and pulled within 1.5 million chips of Hellmuth heading into the dinner break. Still four players remained at that point. It wasn't until the 131st hand of the official final table that Owais Ahmed fell in fourth place, ending a long drought of eliminations. He moved all in over a Hellmuth small-blind limp with the . Hellmuth snapped with the . It wasn't easy for Hellmuth though as Ahmed flopped a king. Hellmuth came from behind on the river with an ace from space and landed the knockout. It seemed as though Hellmuth was spewing a bit and playing somewhat out of control after the dinner break. He was then able to send Ly out the door in third place and set himself for the heads-up battle with Rast. Hellmuth made a good call of Ly's preflop shove with the as Ly held the . The board ran out to give Hellmuth the win and eliminate Ly in third for $665,763. With the tournament now down to two players, Hellmuth had a slight lead with 10.015 million in chips to Rast's 9.185 million. For the first 90% of heads-up play, Hellmuth completely dominated Rast. He crushed him in nearly every meaningful pot and widened the gap to over 13 million. Rast got as low as 2.9 million before an amazing comeback was mounted. First, Rast's held up against Hellmuth's after the money went in on the flop. That put Rast back over five million. He doubled again after fading another flush draw on the flop with the . Hellmuth held the and bricked out. After that second flush-draw fade, Rast and Hellmuth held nearly identical chip stacks. A few hands past that allowed Rast to take the lead before the big and final hand came up. The flop was and Rast fired 500,000. 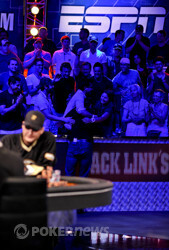 Hellmuth announced that he was all in and Rast stood from his chair, saying, "I'm sorry, Phil, I have the nuts. I call." He showed the nuts with the . Hellmuth had yet another flush draw with the . The turn was the and the river the , both failing to give Hellmuth the flush he needed to win the pot. With that, Hellmuth was eliminated in second place for over one million dollars in prize money — his first-ever seven-figure tournament score. Upon winning, Rast sprung into the arms of his fans on the rail, mainly Antonio Esfandiari, who grabbed him and shook him. Rast was also embraced with big hugs from his parents, all while Hellmuth sat at the table staring into the middle of the felt. 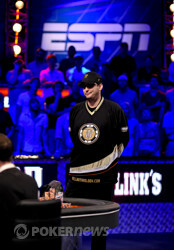 For Hellmuth, he earned his third second-place finish of the 2011 WSOP. For Rast, it was his second WSOP gold bracelet of the 2011 WSOP. Rast walks away with over $1.7 million in prize money, the David "Chip" Reese memorial trophy and the coveted WSOP gold bracelet. He defeated one of the most amazing fields in poker history comprised of 128 of the best players around the world to do so. Congratulations to him on his victory! Brian Rast comes back from a massive chip deficit to defeat Phil Hellmuth and claim the $50K Players Championship bracelet. Brian Rast had the button, and raised to 240,000. Phil Hellmuth called, and the flop fell . Hellmuth led for 300,000, and Rast called. The turn was the , Hellmuth checked, and Rast checked behind. The river was another four - the - and Hellmuth led for 300,000. Rast released, and Hellmuth won the pot. Phil Hellmuth had the button, and raised to 400,000. Brian Rast called, and the dealer fanned . Rast led for 500,000, and Hellmuth moved all in. Rast stood up. "I'm sorry Phil, I have the nuts. I call." "One more fade!" Rast's rail chanted. "One more fade!" The turn was red, but the changed nothing. Hellmuth couldn't look, Rast had his head in his hands, and the room fell silent. The completed the board, and ended the tournament. Rast's friends jumped over the wall and onto the stage, jumping up and down in celebration. After things calmed down, Rast and Hellmuth shook hands. "If I were you, I'd tip that dealer a million," Hellmuth told Rast. Hellmuth will have to settle with a third runner-up finish at the 2011 World Series of Poker, and of course his $1,063,034 in prize money. Brian Rast is picked up off the ground by Antonio Esfandiari. Brian Rast had the button and raised to 240,000. Phil Hellmuth folded. Hellmuth had the button and raised to 325,000. Rast made the call and the flop came down . Rast led into Hellmuth with a bet of 300,000. Hellmuth made the call. The turn brought the and Rast checked. Hellmuth also checked to see the fall on the river. Rast fired 400,000 and Hellmuth called. Rast tabled the for the flush and Hellmuth paid his dues. Phil Hellmuth had the button, and Brian Rast received a walk. Brian Rast had the button, and raised to 240,000. Phil Hellmuth called, and checked as soon as the flop fell . Rast fired 275,000, and Hellmuth check-raised to 600,000. Rast released, and Hellmuth won the pot. Phil Hellmuth had the button, and limped in. Brian Rast raised to 285,000 more, and Hellmuth called without hesitation. The flop fell , Rast led for 375,000, and Hellmuth raised to 900,000. Rast moved all in all in for 4.19 million, and Hellmuth called. The turn was the giving Rast trips, and eliminating the and from Hellmuth's outs. The river was the , Rast's rail erupted, and he is now up over 9 million chips. "WE WILL, WE WILL, RAST YOU!" the crowd yelled. Brian Rast celebrates with his supporters after his first double up. Brian Rast had the button. He raised to 240,000 and Phil Hellmuth moved all in. Rast folded. Hellmuth had the button. He called and Rast raised to 400,000 total. The flop came down and Rast bet 345,000 and Hellmuth moved all in. "All right, I call," was the reaction from Rast. The river was dealt the and Rast was able to hold in order to double up. "We will, we will, Rast you!" chants began ranging from his cheering section. Rast went over to his cheering section of the stands and asked, "Who has a beer? I want a sip." Rast doubled to over five million in chips. Brian Rast poses with The Chip Reese Memorial Trophy after winning event 55, The Players Championship.